Hawaii is the United States’ own tropical paradise. Consisting primarily of eight volcanic islands, Hawaii boasts mild weather, stunning waterfalls, gorgeous vegetation, and colorful, sandy beaches. Renewable energy resources are crucial for maintaining the natural beauty of this pristine state. Hawaii’s sunny climate is perfect for solar panels. Some progress has been made regarding legislation about solar energy, including state tax credits and methods for hooking into the power grid. However, Hawaii still has a lot of room for improvement. Regardless, setting up a solar energy system will save you a great deal of money, as Hawaii has some of the highest electricity rates in the country. Refer to the graph below that details the Swanson Effect to see how much solar energy costs have dropped over the past several decades. You can rest assured that when you set up solar panels in Hawaii, you will see significant savings more quickly than you would in other parts of the US. 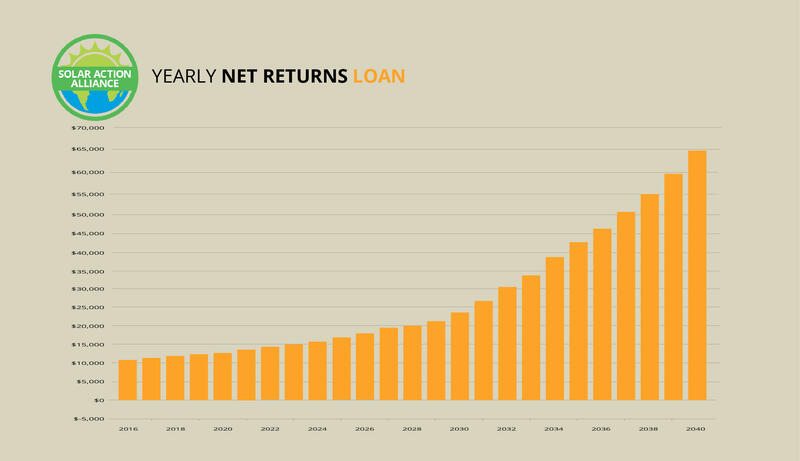 The graph below shows the average 25-year return on investment (ROI) for three different ways to access solar power: leasing, buying outright, and buying on credit. 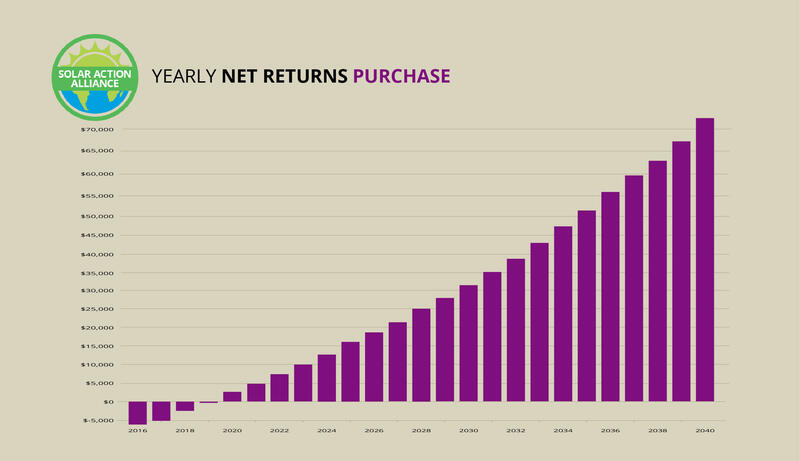 While purchasing offers the highest ROI in the long term, it requires a significant amount of money on the front end. If you do not have cash and do not qualify for a loan or line of credit, you can enter a power-purchase agreement (PPA), which is essentially a lease. 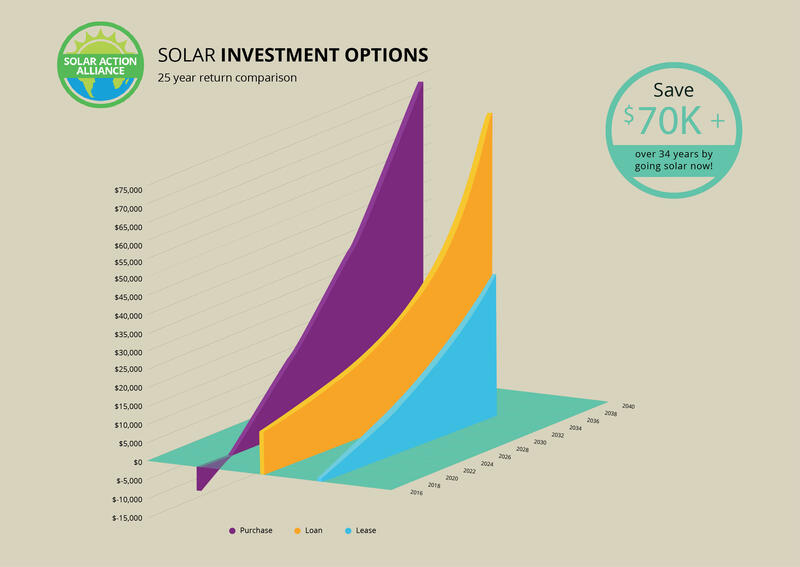 Keep in mind that choosing this option minimizes your savings, but you will still save more than if you didn’t invest in solar power at all. In this arrangement, you can set up a rooftop system of solar panels for no money down. Then you will make monthly payments while your electric bill diminishes. The best solution is to choose a home equity line of credit (HELOC) for residential solar panel power in Hawaii. This option requires no money down, and the monthly savings on your electric bill will more than pay for the loan installments. Even better, you will receive major federal and state tax credits during the first year. There is absolutely no downside to this investment option. The way things used to be, purchasing was the only way to go solar. As mentioned above, purchasing offers the best ROI. Your initial investment is offset by tax credits, and you will see immediate savings on your electric bills. While putting several thousand dollars down is a significant investment, you will recoup that amount within the first few years. After that, the ongoing savings in your energy bills will generate you more money. If you save the difference between your old and new bill every month, you will have made over $70,000 within 25 years. Although leasing is a great option for converting to solar power in some states, that is not the case in Hawaii. Because Hawaii’s electricity rates are so high, purchasing works out better in most cases. Nevertheless, do not worry if you cannot afford to purchase and do not qualify for a loan or line of credit. Leasing may not be the best choice, but it is not a bad one at all. With a lease, your payment combined with your new utility bill will still be significantly less than your previous utility bill. You start saving from day one, and you’re likely to save $100 or more monthly. That adds up to many thousand dollars of savings over a 20-year period. One great benefit of a lease is the lack of maintenance on your part. When you own your own home, you have to pay for plumbers, electricians, and the like (or do the work yourself). When you rent an apartment or other unit, maintenance is relegated to the management company. When you lease a solar panel system, the company who handles the installation is also responsible for maintaining the panels. Therefore, while you may not make quite as much money as you would as a purchaser, your experience is hassle-free. Purchasing solar with loan money is the smartest way to go, because you can use somebody else’s funds to foot the initial costs. And since electricity costs are so high in Hawaii, you can use the savings you reap on each month’s energy bill to make your loan payments. In addition, you get the same tax credits that other buyers get. 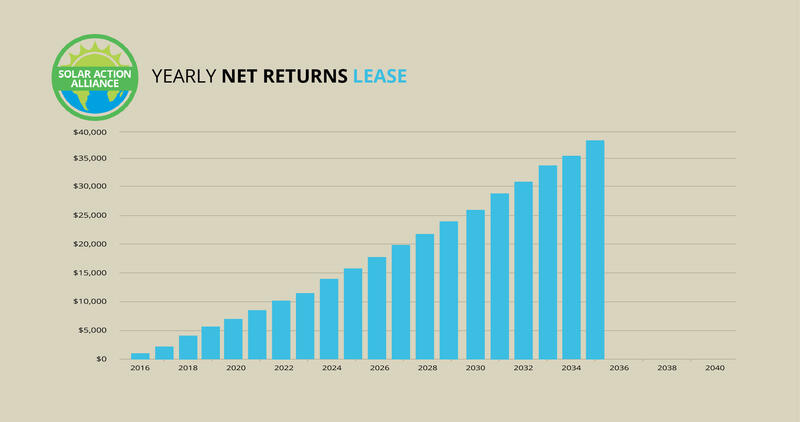 Essentially, leasing is a no-risk option. All you have to do is apply for a HELOC for $20,000. If you are approved, you are on your way to simultaneously saving money and saving the earth. Solar power accessibility is largely determined by state laws and public utilities. A state’s natural climate has less to do with the success of solar panels than you might think. The good news is that in Hawaii, legislation has mandated that 100% of its energy must come from renewable sources by 2045. In other words, when it comes to converting to solar power, Hawaii is all systems go. In fact, this state is setting the benchmark for most other states! 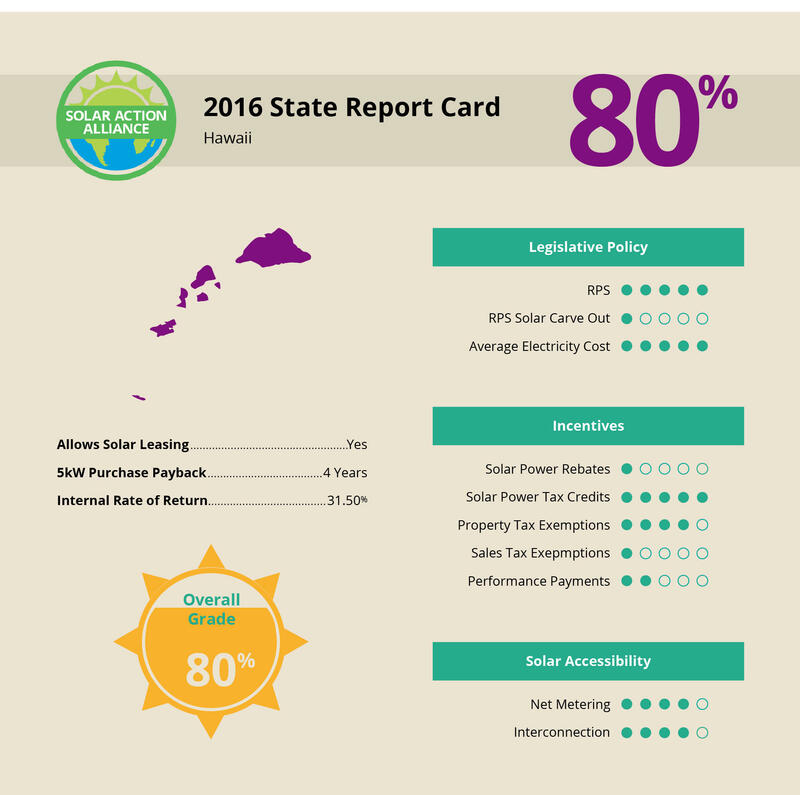 The main factor affecting Hawaii’s solar power rating is the high electricity rates throughout the state. The amount of money you can quickly save by going solar is probably more significant than anywhere else in the nation. On that basis, Hawaii gets an A+. That is not to say that Hawaii gets top scores across the board in all aspects of solar panel energy. For example, there is no solar carve-out in Hawaii’s RPS, meaning that utility companies are not required to generate any solar power on their own. The state also has limited performance payment, and it does not offer homeowner rebates or sales tax exemption for solar energy. Nevertheless, you have every reason in the world to convert to solar power in Hawaii.